If you want to make a screw of wood, the first tool you would think baout is a lathe. But you can also make a screw on a scroll saw. In fact, I was stunned to learn of a surprising technique for using a scroll saw to make nested screws from a single cylinder of wood. 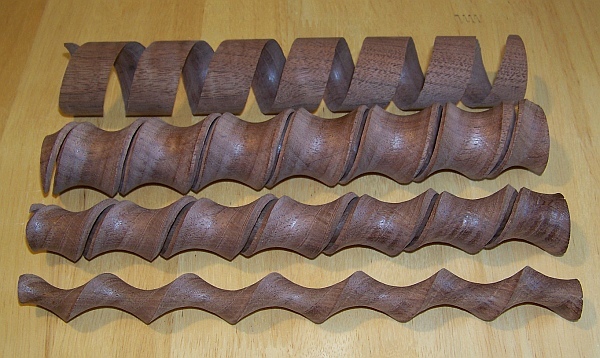 These four helices were cut by Steve Garrison, who was the first to think of this, as far as I know. They nest inside of each other beautifully, because they started out that way. Steve’s website explains the technique, which is so simple that anyone can make a basic screw in minutes. Simply tilt the scroll saw table, clamp a piece of wood to the table to serve as a fence, and push a dowel through the blade while twisting it. To make a smooth spiral cut, first mark a spiral on the dowel, to guide you in controlling the twist as you push. Use a “spiral” blade, which has teeth on all sides, because different parts of the rotating wood hit opposite sides of the blade. In general, the top of the blade will trace one spiral on the cylinder’s surface and the bottom of the blade will trace another. What Steve realized is that by varying the table tilt and the distance from the blade to the cylinder’s center line, you have two parameters for adjusting where those two helices lie on the surface. There are multiple combinations of these parameters which make the two surface spirals coincide. In other words, the blade can always come out of the same spiral from which it enters, while cutting in at various depths. Because these surfaces are cut by a moving line, all the spirals are examples of ruled surfaces and, more specifically, are types of generalized helicoid. I have found this a great puzzle to hand to a woodworker and ask them how they think is was made. This article first appeared on Make: Online, July 25, 2011.